Wine estates, vineyards and river cruises are only part of the Douro wine region’s story. If you want to delve deeper into the local culture, traditions and history, you might want to consider adding a traditional village or two to your itinerary. Note: You’ll need a car to get to most of these Douro Valley villages. See my tips for renting a car in Portugal. If you’d rather not drive, a private tour would be another way of getting around. Tell me what you’re interested in and I’ll connect you with a suitable tour operator. You’ll also ideally need to be spending at least a night in the Douro. I’ve included accommodations in or near each of these villages but if you’d prefer a more central base, take a look at my Douro Valley accommodation guide. Alternatively, if you’re fit and have several days to spare, you could visit some of these wine-producing villages on a walking holiday in the Douro. Not wishing to feel left out by Portugal’s collection of restored historical villages (Aldeias Históricas) and its chain of schist villages (Aldeias do Xisto), the Douro Valley has a route which highlights six of its wine-producing villages (Aldeias Vinhateiras) for visitors to this UNESCO World Heritage region: Provesende, Favaios, Trevões, Barcos, Salzedas and Ucanha. Each of the wine villages has strong ties to the Alto Douro wine region and has something to offer in terms of culture and tradition. Thanks to investment from the project, many buildings have been restored and museums created, giving you an insight into Portuguese history and rural lifestyles both past and present. Among the Douro wine villages, you’ll find the remains of Iron Age settlements; Roman roads and bridges; Romanesque churches, Cistercian monasteries and 17th century palaces; age old traditions and handicrafts and well-established wine estates (quintas). Plus some incredible scenery as a bonus. How many of them you visit and in which order you do them will obviously depend on where you’re based and how much time you’ve got. I’ve only been to three of them so far but I’ll give you a run down on what to expect from each of the six wine villages and their most important features. This is the closest Douro wine village to Pinhão, one of the major stops for boats and trains along the Douro river. Life in Provesende can be traced at least as far back as the Iron Age; if you follow the steep track to the schist chapel at Picoto de São Domingo, you’ll find remains of the settlement. If that doesn’t impress you, the 360º view will. The village itself has a surprising number of grand manor houses decorated with stone coats of arms. These stately homes are interspersed with picturesque cottages built from local schist stones and surrounded by flowers. Don’t get over-excited; this isn’t the prettiest village in Portugal by a long shot but it’s pleasant and even charming in parts. The main square is dominated by a double-spouted granite fountain and is backed by the rolling Douro hillsides. If the bakery is open, it’s worth popping in. Nothing much has changed since it was established in 1940 and you might get lucky and see the local bread (pão) or meat cake (bolo de carne) being prepared and cooked in a traditional wood-fired oven. If not, you can just buy some to taste. The bar on the square, Café Arado, is one of the most bizarre places I’ve been in. It doubles as a quirky museum and craft shop and is crammed with labelled farming tools and odd sculptures. The exhibition is free to view but if you want to take photos, it’ll cost you 1 euro. They have a pool table but there’s very little space to manoeuvre. You can, if you’re feeling very fit, walk from Pinhão to Provesende following a marked trail but be warned, it’s incredibly steep. I’d be more inclined to take a taxi uphill and walk down. If you fancy staying in the village, there are several accommodation options in and around Provesende. One of them, Morgadio da Calçada, is part of a 17th century mansion. They offer wine tastings, workshops and activities as well as a bed for the night. I haven’t stayed there but it looks good. The modern guest rooms are in the former storage sheds in the courtyard but the rooms in the main house still have period furnishings and family photos and paintings. 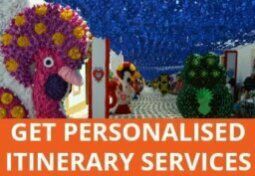 Check availability and prices. Just outside Alijó, you’ll find Favaios, another village that stems from an Iron Age settlement. Vilarelho Castro is the largest of these settlements in the area. To visit it, drive along the football field road then walk along the track for another kilometre. Favaios is known for its moscatel wine and you can find out how it’s made and what it tastes like by visiting the Adega Cooperativa (cooperative winery). Standard visits are free and they have special programmes during the grape harvest in September and October. On Rua das Padarias, near the main church, you’ll find several bakeries where you can buy freshly baked four-cornered loaves. One of the most renowned belongs to the indomitable Manuela Barriguda and is open late on Tuesdays and Fridays whereas the others only open in the morning. Carry on up this street towards the Santa Bárbara viewpoint. For vineyard tours and wine tastings near Favaios, you could try Quinta da Avessada. Just follow the signs. 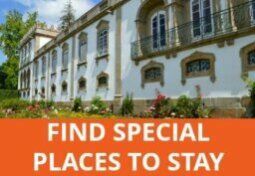 Accommodation in the Favaios area includes the gorgeous manor house of Casa dos Barros in Sabrosa (make sure you get a decent-sized room though) and the Pousada de Barão de Forrester in the nearby town of Alijó, less than 3 km from Favaios. Another possible base is Pinhão, where you have more choices, plus a few restaurants. The luxurious Vintage House Hotel overlooks the river, although if you prefer more modern decor, LBV House might suit you better. Quinta do Passadouro is more isolated but a delightful place to retreat and unwind and is near a simple river beach. In the same area (Vale de Mendiz), you could also look at Quinta do Silval, which has a pool, onsite restaurant and great views – check availability and prices. 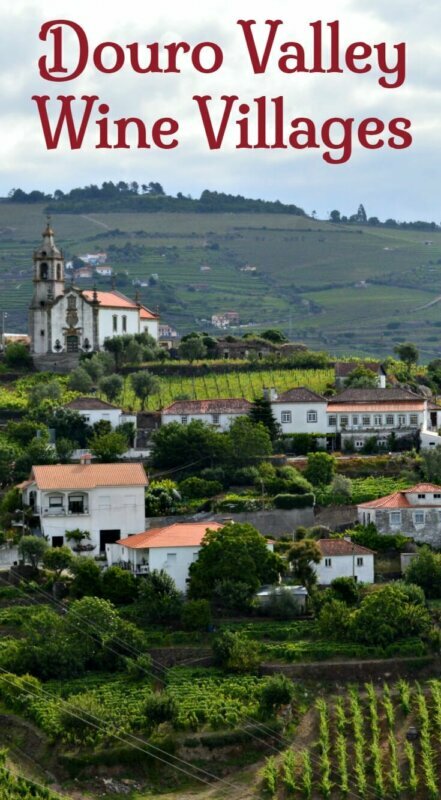 Trevões is a bit further out than the other Douro valley wine villages and was selected because of its impressive collection of historical architecture, as well as its wine and scenery. Being on a plateau, it’s got views of the vineyards spreading downhill and forested mountains with granite outcrops above. The main church was started in the middle ages and given Gothic additions and a pretty ornate wooden ceiling in the 16th and 17th centuries. Trevões also has seven chapels, enough for each of it’s manor houses. If you’re into religious art and jewellery, you might want to check out the Sacred Art museum. The Museu do Trevões celebrates local traditions and rural life with displays of kitchen, household and agricultural tools and objects. There’s a cosy little bar on the upper floor, too. 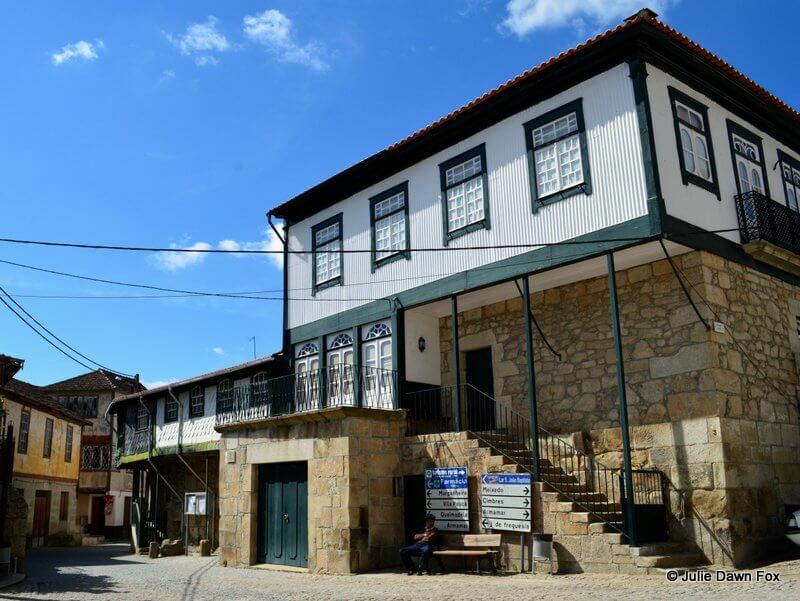 As well as the spectacular views over the Douro vineyards and hills, the medieval village of Barcos has some buildings of interest, several relating to its former status as seat of the key judicial and parochial powers in the Sabroso municipality. Notable buildings from this era are the former city hall and a prison for both men and women in the main village square. Death sentences were carried out in Mata da Forca (Gallows Woods) on the eastern edge of the village. Just off the square, at the end of Rua da Fonte Velha, is the old fountain the street is named after and Casa da Roda dos Expostos which used to take in abandoned children. Look out for the communal laundry where you may still find local women scrubbing their sheets at stone wash basins and catching up on gossip. The parish church is thought to be of Saracen construction dating back to the 8th century. 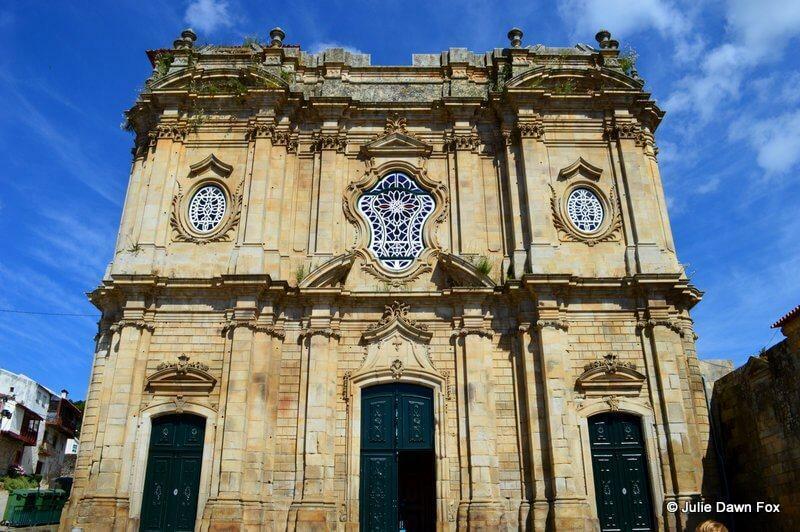 The nearby Capela da Santa Bárbara is home to the exposed remains of Maria Adelaide de Sá Meneses, a local woman who, despite not leading a particularly pious life, has been raised to the status of a saint in local lore. Her perfectly preserved body was found in 1916 after being buried in a lead casket for 38 years. Locals swear that her hair and nails are still growing. More curiously, she is said to have had an aversion to shoes and the colour black and for some reason, local brides donate their wedding dresses to her. Tip: The other two Douro wine villages, Ucanha and Salzedas are very close to each other, northeast of Tarouca, where there is a wonderful monastery church. If you’re planning to visit Murganheira sparkling wine cellars, you could combine it with a look around one or both of these wine villages. If you want to base yourself in this part of the Douro wine region, there are several accommodation options around Tarouca and Lamego including the fabulous Hotel Rural Casa dos Viscondes da Varzea, where I was able to take part in the grape harvest (on a very superficial level). There’s also a farm stay at Quinta do Santo Antonio or the modern luxury of the Delfim Douro. Another charming and popular wine estate you can stay at is Quinta da Pacheca. As you enter the village, turn right before you get to the monastery so you can enjoy the view from Miradouro da Senhora da Piedade before you park up to explore Salzedas monastery and the peculiar architecture of the Jewish quarter. The main draw of this wine village is its Cistercian monastery, started in 1168 but never completely finished as you’ll notice from the absence of towers. You can still see some of the original stonework under the later additions if you walk down the sides of the church. It’s simple yet beautiful with stained glass windows and high vaulted ceilings. Following the state abolition of monasteries and convents in 1834, the building was abandoned and left to ruin until fairly recently. After nine years of restoration work, Santa Maria de Salezadas Monastery reopened to the public in 2011. It’s used for services, as you’ll see from the personalised cushions in the pews. While the church is free to enter, you’ll need to pay 3 euros to see the monastery, except on Sunday mornings. It’s closed Mondays and Tuesday mornings, the first weekend of the month, national holidays and September 29th. Other than that, opening times are from 9.30 to 1 pm and 14.30 to 6 pm. Aside from its pretty collection of typical balconied village houses, stone pillory and parish church, the main reason people come to Ucanha is its Roman bridge over the River Varosa. What makes this one so special is the 20 metre tower, added in the 15th century to collect tolls and taxes. If possible, climb up it for views over the village and countryside. If you’re lucky, you might catch one of the medieval reconstructions that take place from time to time with chariots and costumed actors. 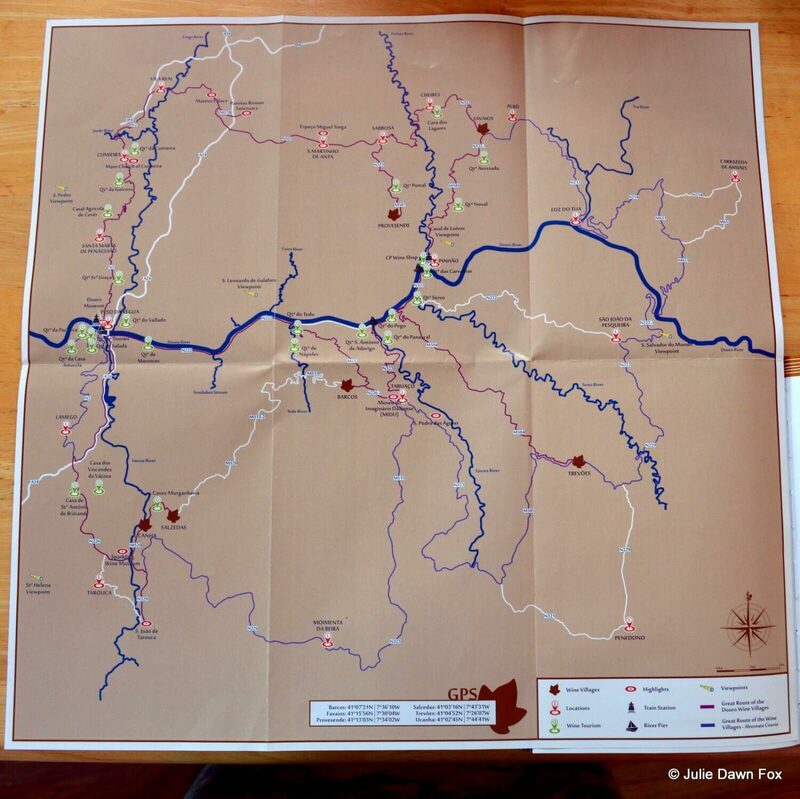 While I’m waiting for a pdf of the Douro Wine Villages Route Map to share, this should help you get a sense of where things are within the wine region. Click on the photo for a larger image. Map of the wine-producing villages route in the Douro Valley. Photographed from the Douro Wine Villages Tourist Guide in lieu of a pdf. For more information about visiting the Douro wine region, check out this article: How and when to explore the Douro Valley. 6 wine producing villages in the Douro wine region to explore. Disclosure: Some of the links in this article are affiliates. This simply means that if you book accommodation using my link, at no extra cost to you, I may receive a small commission that helps towards the running costs of this blog. hi Julie, we plan to take a train from Porto to Pinhao/Regua to enjoy the riverside views and start a tour from there to include a night’s stay to return by train again the next to Porto in time for dinner. What would you suggest as a tour guide and accommodation? My family and me are visiting the Douro region in the beginning of august. We are very interested in tasting some wonderful wines on a beautiful vineyard. I was wondering if you could maybe recommend one of the ‘wine cities’ or a vineyard to do so. 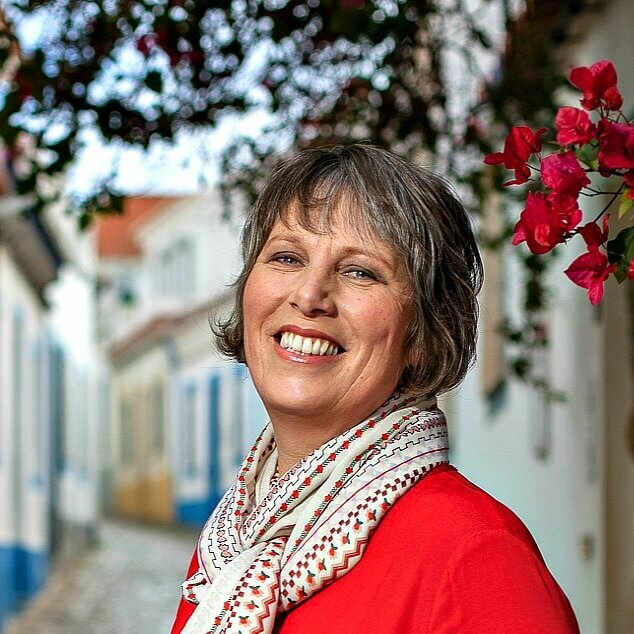 Hi Ruth, you haven’t mentioned how you’re planning on getting around in the Douro Valley but if you’re relying on the train, aim for Pinhão – there are a couple of wineries within walking distance or a short taxi ride of the train station, e.g. Quinta do Bom Fim, and you can also take a short boat ride on a traditional wooden ‘rabelo’ from there. Hi Julie, this is such a great blog. We are going to the Duoro Valley in 2 weeks. Which of the villages would you recommend the most as we probably won’t have time to see them all. I’m planning to spend Saturday evening and Sunday day there, but was worried that wine tasting may not be open on Sunday. Do things generally close on Sunday? Thanks for all your help. Hi Sara, Sorry about the delay – I’ve been away! You’ll find most vineyards open on Sundays so no worries there. As for villages, it depends where you’ll be but you could start with Provosende and head to Favaios for some great scenery in between and a chance to sample the moscatel in Favaios. Julie – my daughter and I just returned from the Douro region. (Also went to Porto.) She had a few quinta tours set up. We used your info extensively and I wanted to thank you for making our trip so much better than they otherwise would have been. We went to three wine villages – Provosende, Ucanha and Salzedas. I wasn’t sure what to expect. The villages were much less developed and ‘touristy’ than I would have thought. the only thing that I could see that they did was to put the markers up showing info on the village and where the points of interest were. But we were glad to just stroll around. One question I did have was….at each village there were small groups of men sitting outside the cafe or general store when we pulled up and parked. We would give a nice “Bom Dia” and smile and nobody would respond, smile or otherwise seem AT ALL welcoming. I would go so far as to say they seemed resentful of our presence. We never felt unsafe but did feel somewhat unwelcome. I wonder if you know if the residents are not in favor of the attention their villages are receiving. We didn’t see any other tourists at any of them while we were there. And all churches seemed closed/locked. I was not expecting a red carpet welcome and people to come fuss over us in any way (or even interact with us at all). But at all three, they seemed negative to our being there. It did not detract from our experience and I am so glad we went. But I did wonder about it…..
Hi Amy, Did you get to go inside the monastery at Salzedas? That should be open most of the time. As far as grumpy old men are concerned, I think they’re a fairly ubiquitous feature in Portuguese villages and although it might be possible to raise a smile out of some of them, they do tend to be suspicious / dismissive of strangers. I don’t know if there is some deep seated resentment or just that they don’t see the point of interacting. I’m sure that if you approached them to ask for help that they would, in fact they would probably go out of their way to do so. Like you say, these places haven’t been touristified in any significant way and they don’t get many visitors, especially out of season. I wouldn’t take it personally – I’ve had very similar experiences all around the country. I’m not surprised. Portuguese wines may not be very well known around the world but there are some truly lovely ones to be had. Thanks for your blog which has given me a much better insight into the area than a Travel Guide would. We have a Portuguese friend who owns a house near Villa Nova de Foz Coa which she and her husband want us to borrow and we’re really looking forward to staying for a few weeks this year and travelling on the railway and visiting some of the vineyards and sampling some of their wares! Being partly Portuguese by blood – my parents originated from India and are part English / Portuguese / French – I’m really looking forward to the visit and am currently learning some basic Portuguese in anticipation. I will be taking a copy of your blog with me. Thanks once again. Hi Roy, Thanks for taking the time to comment. Funnily enough. I just got back this afternoon from a trip to the Vila Nova de Foz Côa area. The almond trees are in blossom at the moment and it’s absolutely beautiful. If you’re interested in art, you should also take advantage of being in that area to see some of the 25,000 year old rock engravings in the countryside. Have a wonderful time, whatever you do! Sorry to have missed the almond blossom this year. Perhaps next year? I was fascinated to learn about the Douro railway and have just bought a DVD of the journey on ebay for £2.99 which we will be watching this evening. I suspect it is just as leisurely as the river trip but a lot cheaper! 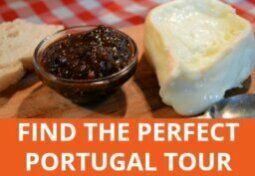 We also have a Portuguese couple in our congregation from the Coimbra area and they are hoping to join us for a trip to Portugal next year – they came to England to find work and ended up near us in Devon – different area of Portugal, but sounds really interesting. It is a friend of theirs that owns the house in Foz Coa. I have just read the 1968 book by David Wright and Patrick Swift, “Minho and North Portugal” and a 1956 book by Hector Bolitho, “The Wine of the Douro” about a visit to Quinta do Bomfim over the time of the vendage (What is the Portuguese term?). It will be interesting to find out how much has changed – or not – when we visit later this year – over 50 years later. It would be good to catch the harvest and see how similar it is to the description Bolitho gives – very unmechanised and ritualised with some quite rude singing to accompany the treading of the grapes!